The San Damiano Cross can be found in every friary, in Franciscan Universities, and in the home of, probably, every Secular Franciscan home in the world. This cross is a reproduction of the crucifix through which God spoke to Saint Francis of Assisi in the year 1205, saying “Go, Francis, and repair my Church which, as you see, is falling into ruin.” At first Francis misunderstood and proceeded to repair only the San Damiano Chapel, where this crucifix was located. Eventually his acts of poverty, humility and charity brought about repairs to the entire Catholic Church. 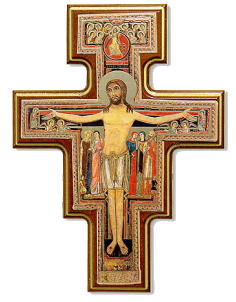 The San Damiano Cross is a painting containing images of Christ’s passion, death, resurrection and ascension into glory. Its thematic colors are red and black. Red, the color of Christ’s blood which he shed for us, symbolizes God’s love. Black is the color of death. The artist left us very little written explanation of his work, just names under the figures standing around the cross. The following interpretation of what his pictures represent is drawn mainly from several descriptions. On the lower part of the cross, near Jesus’ left shin, is a very small picture of a rooster, reminding us of Peter’s denial during Christ’s Passion, and his subsequent repentance and conversion. The tiny rooster is a small reminder that if Peter could fail any of us can fail. Of much larger importance is that, like Peter, we should repent after we fail and turn again to the Lord, and by this example lend moral strength and encouragement to our brothers and sisters in Christ. Directly below the rooster is the barely perceptible figure of a person. This may be Saint Peter, looking up at the rooster; or perhaps it is a self portrait of the artist; or perhaps it represents you and me. The square panel below the arms of the cross portrays those present at the crucifixion of Jesus. Under Christ’s right arm the Blessed Virgin Mary stands next to Saint John. Their eyes obey the words Christ spoke to them from the cross: “Woman, behold, thy son” (John 19: 26) and, to John, “Behold, thy mother” (John 19: 27). The blood of salvation falls from the wound in Christ’s side onto John’s mantle. Dressed in scarlet, Mary Magdalene stands in a place of honor next to Christ. Next to her is the other Mary. At the far right stands the Roman Centurion of Capernaum, who, at the crucifixion, voiced his belief in Christ. He holds a piece of wood in his left hand, symbolizing his building of the synagogue (Luke 7: 1-5). The thumb and two fingers of his right hand are raised in a symbol of the Trinity, while the two closed fingers signify the mystery of the two natures of Jesus. Four heads peer over the shoulder of the centurion. Are they the centurion’s servant, healed by Jesus, and soldiers (Luke 7: 6-10)? Or, are they the centurion’s son, healed by Jesus, and household of believers (John 4: 46-54)? Two minor figures (as indicated by their smaller size) stand at the bottom corners of the crucifixion-scene panel. On our left is the Roman soldier who pierced Jesus’ side with a lance (John 19: 34). On our right is the bystander who offered Jesus a sponge soaked in common wine after Jesus cried out “I thirst” (John 19: 28-29). According to Christian tradition they are named Longinus and Stephaton (or Steven). Drops of Christ’s redeeming blood, dripping from his elbows, bless these witnesses too. “He descended into hell; the third day he arose again from the dead;” (Apostles’ Creed). Under Christ’s feet we see the black abyss of the dead, and several haloed figures. These are the souls of holy people who died before Christ and were awaiting Salvation before being admitted into Heaven. Blood pours over them from the wounds in Christ’s feet, signifying their long awaited redemption. The central figure of the San Damiano Crucifix is Christ risen from the dead on Easter Sunday morning, clad in a formal loin cloth symbolic of both high priest and victim. He stands upright, no longer hanging from nails. His eyes are open again. His face radiates a calm expression of peace in the knowledge that the price of our redemption is paid. His wounds continue to pour out the blood of his love for us. On the arms of the cross, behind Christ’s outstretched arms, is a black rectangle representing the empty tomb. The red stripe over the black tomb signifies that the red of God’s Love is victorious over the blackness of death. At either side of the empty tomb stands a saint. These are probably the women who discovered the empty tomb early on Easter morning. Some say the figures are Peter and John, who arrived on the scene later, but Peter is usually portrayed with a beard. Beneath each of Christ’s wrists are two angels in heated discussion. Are they angels at the beginning of time, arguing whether to worship the Son of Man? Is this Lucifer debating Saint Michael? The rectangular panel at the top of the cross represents heaven. Emerging from a circle of red and entering heaven we see Jesus, fully robed in garments of gold. In his left hand he carries a golden cross which is his royal scepter and a sign of his victory over death. Choirs of angels welcome Jesus into heaven. Within the red semi-circle at the top of the scene we see the right hand of the Father with two fingers extended in benediction, blessing all that Jesus has done. The hand also symbolizes God maintaining Creation and sending us his Holy Spirit, a gift merited by Christ’s sacrifice. The original cross, approximately 6 feet tall by 4 feet wide, is a painting on linen glued to walnut. An unknown artist produced it sometime prior to 1205, the year in which Francis knelt before it in the San Damiano Chapel. The abandoned, neglected and half ruined condition of that chapel in 1205 suggests that the cross may be considerably older. The artist may have been a Syrian monk: the iconography shows a strong Byzantine influence, and local history says there had been Syrian monks in the Assisi area for centuries. In 1257 the followers of Saint Clare of Assisi, the Poor Clares, left San Damiano for San Giorgio and took the Cross with them. They preserved it for seven centuries. In Holy Week of 1957 it went on public view in the Basilica of Saint Clare (Santa Chiara) in Assisi, where it may be seen today. All-highest, glorious God, cast your light into the darkness of my heart. Give me right faith, firm hope, perfect charity and profound humility, with wisdom and perception, o Lord, so that I may do what is truly your holy will. Amen. The San Damiano Cross is an icon of the paschal mystery of Christ, a visual reminder of the tenets of our faith. It has the power to reinforce our faith and thus help repair God’s Church today, as Saint Francis did centuries ago.